The Southern Hairy-nosed Wombat is a stout and robust animal with strong claws adapted to digging. 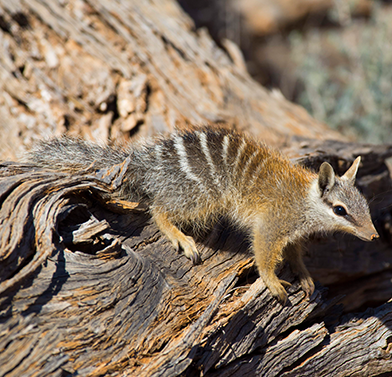 Distributed patchily in areas of semi-arid shrubland and Mallee, populations are highly fragmented. The greatest threat to the species is currently Sarcoptic mange. AWC protects populations of the Southern Hairy-nosed Wombat at Yookamurra and Dakalanta Wildlife Sanctuaries. 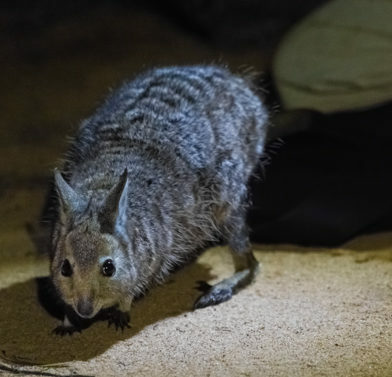 AWC protects populations of the Southern Hairy-nosed Wombat at Yookamurra Sanctuary in the Murraylands region and Dakalanta on the Eyre Peninsula of South Australian. We help limit gazing competition from exotic herbivores by conducting regular control of feral goats and rabbits. The greatest threat to the species is currently Sarcoptic mange which can kill 80–90% of affected populations/groups. 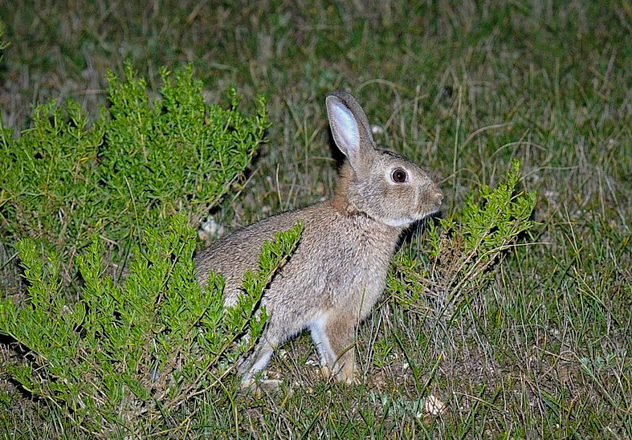 Other threats include habitat destruction and fragmentation, illegal culling, grazing competition from domestic livestock and feral animals such as rabbits, collisions with motor vehicles, and drought which can prevent successful reproduction. The Hairy-nosed Wombat is a stout and robust animal, approximately 800–900 mm long and weighing approximately 20–32 kg. The wombat’s silky fur is grey–tan coloured with whitish patches beneath the eyes. The head is robust and flattened, ears pointed, and the snout somewhat resembles that of a pig. Interestingly, the teeth of Southern Hairy-nosed Wombats continue to grow throughout their entire life. This is likely to be an adaptation to the tough and abrasive vegetation that they feed on. The Southern Hairy-nosed Wombat is a long-lived species (reaching up to 15 years in the wild) with a low rate of recruitment. The species lives in extensive underground burrow systems which can contain several individuals. 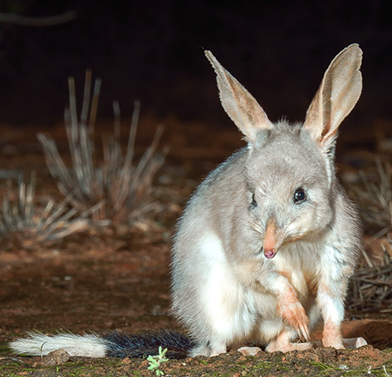 Females produce a single young that lives in the pouch for six to seven months and is weaned after about a year, although in drought years reproduction may cease completely. Like other wombats, this species eats grasses, forbs and sedges, but when these are not readily available it will also feed on woody shrubs. 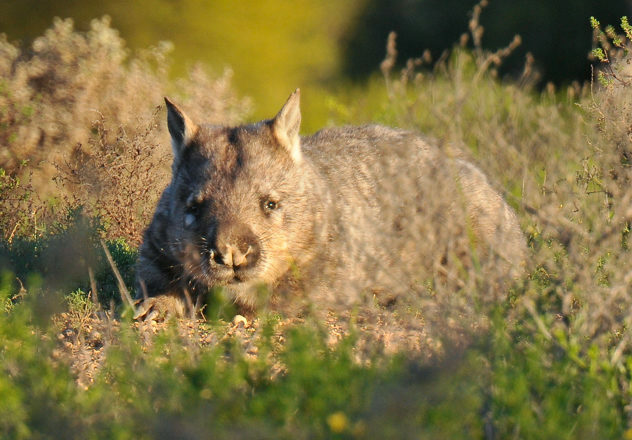 The Southern Hairy-nosed Wombat is distributed patchily in areas of semi-arid shrubland and Mallee in the south-eastern corner of Western Australia, and the Eyre and York Peninsulas and Murray Mallee region of South Australia. 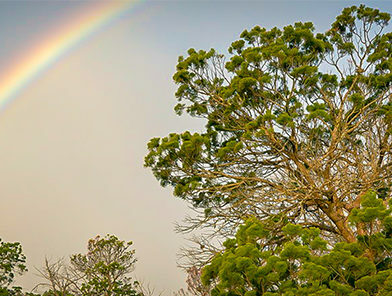 It has also been recorded in far south-west New South Wales. Populations are highly fragmented but the total population size is estimated in the vicinity of 60,000–130,000 individuals.